We consistently get asked many questions by our existing clients and moving companies in general regarding their blogs and search traffic in general. So we thought we would take a step backward and discuss some here. If you think about it, there is one main purpose for your website – to get a prospective moving customer to call you, email you or fill out your “request a quote” form. When one of those 3 things, or events, is completed, your website and all the SEO that goes into it has succeeded. This can’t happen without search traffic. But traffic is really a vanity metric. It can be good for the ego, especially that of an SEO company. It is great to show a client that their traffic is increasing, this IS a good thing. But a blog is supposed to be a customer acquisition channel, not a traffic acquisition channel. So yes, we are saying, it’s not about traffic, it’s about the right traffic, and then more of that traffic. We worked with a moving company client that had previously written one particular blog post on their site which accounted for over 20% of their search volume. But when we dug into the metrics, none of that traffic converted to a call, email or filling out a form. Yes, it was great for the ego – it DID increase traffic, but it had nothing to do with moving customers. In SEO terms we know we have a good blog post when the keywords the post is optimized for have high “search intent”. Ok, another new buzzword! What the heck! But if you think about it, this will make total sense. We rank keywords from the number 0 to 3, where 0 is a keyword query that has nothing to do with moving or the future need to move, and 3 is someone that is looking for a mover now. That is what we mean by search intent, what is the intended result of the searcher. For example, if someone types the keyword query “planning a move to san diego”, “moving to san diego” or “how to move to san diego” and your blog post comes up at the top of the page, you have a high chance of getting them to convert to a potential client. These keywords and the many synonyms around them are definitely “high intent” search queries. We want that traffic. So we recently wrote a blog post for one of our clients 10 Things you must know before you move to San Diego to do just that. This post holds the top position for “planning a move to san diego”. 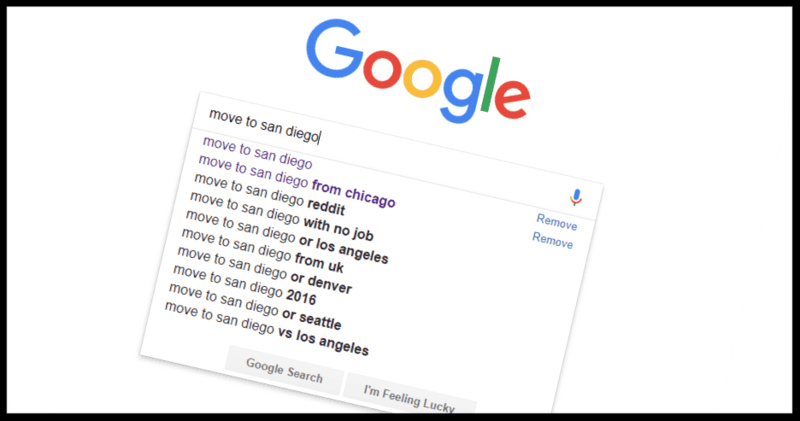 This blog post, although relatively new is already ranking in the top for many keywords related to “moving to San Diego”. It also is getting a large and growing search volume from all over the U.S. Its power is only going to grow over time and you can certainly expect that some of those landing on it, will want to fill out one of the forms on the page. In later posts, we are going to talk more about featured snippets. That is when you write a blog post that answers a search query question and Google rewards you with the answer. So keep on blogging and make sure the keywords you are targeting have “high search intent” and you surely can’t go wrong.